The second of my series of exam duties was at Raichur. Although Raichur lies on a very busy railway line, and is fairly well connected by trains from Bengaluru, the timings of none of the trains met my requirements. I had taken a bus to Raichur last year for the same reason (read here), and I was all set to repeat the same thing this year as well. I checked for options from private operators, but none of them had good ratings on redbus, and I was a little confused about the route they take. 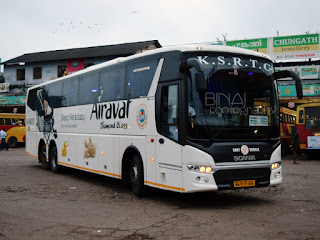 I finally opted for the tried and tested option - KSRTC Airavat Club Class. The occupancy in the bus seemed good, and I opted for a seat towards the rear. The seat map showed a Scania, but some reports on Whatsapp groups indicated that they were sending Volvos off late. I hoped I'd get a Volvo as well - the Scania is too bouncy for comfort. 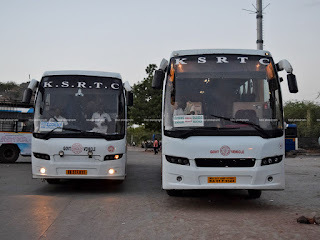 KSRTC Bus : PNR :J7******7,Journey Date :17-Jun-2018 21:52,Trip Code :2152BNGRCH,Bus Number :KA01F9144,Depot :BENGALURU 4,Crew Mobile No:944****955 . Happy Journey. I was busy with all cab aggregator apps through the time - none would have a cab for me. I finally booked an auto, which would take me to the nearest metro station. Luck decides to play a cat-and-mouse game with me - the auto turns late, the driver drives slow, gets stuck in every traffic signal, and the train leaves as we near the metro station! 21:30: I run to the platform, to see a 7 minute waiting time for the next train. I quickly evaluate options of taking taxi to Majestic (Kempegowda bus station) or worse to Hebbal. The maps showed that the traffic was really high, and there was no way I would be able to make it. The train itself would be a better bet. Given the waiting time, the earliest I would make it to Majestic would be 2150hrs - the bus leave at 2152hrs. I call up the conductor and apprise him of the situation - he replies in a stern voice that he wouldn't wait. I request - he hangs up. 21:37: The train rumbles in. I manage to get a seat. Restless and sweaty - I quickly search for alternative options. I realise that there is a bus half-an-hour after mine - and had seats in the last row as well. I keep hoping I make it to the bus. The train operator seems to be in a hurry as well - he flies from one station to the other. The train was quite crowded as well. 21:54: We roll into Nadaprabhu Kempegowda Station Majestic. I run out of the train, rush up the escalators, and reach ground level. I call up the crew as soon as my phone gets back to mobile network (the underground stretch doesn't have mobile network connectivity). I was hoping for the best - the conductor picks up the call, and says he is still at Platform 19, and asks me to rush. I inform that I have reached the bus station, disconnect the call and continue running. Although there is an exit from the metro station right next to this platform, they do not open it for some vague reason, and passengers end up having to take a very long way to get to the platform. 22:00: I reach the platform, panting like a dog and wet as if I was in the rain. I take some time to locate my bus - the conductor was standing next to the door. "Seat number 33?" he asks as I near the door. "Get in. Do you have baggage?" "No". He checks my m-Ticket, asks for my identity card, and then signals the driver to start. The bus backs out of the platform at 2203hrs - 11 minutes late. All because of me. The conductor came to my seat to check if I wanted something - I apologise, he smiles back and says - its okay sir. 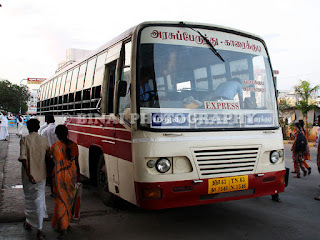 The driver navigates the beast out of the bus station quickly, gets on to the flyover, and turns towards Kumarakrupa road. Traffic on the road wasn't very high. The bus after dropping me at Raichur.. The AC was in full force - may be the driver did that to cool me down. I moved the curtains to see the baby sleeping there (Airavat Club Class buses have an image of a baby sleeping on a pram stuck on the window) - the sticker was fully opaque. We rolled into Ganga Nagar CBI bus stop by 2221hrs - finish pickup and leave by 2223hrs. The lug happy driver was busy navigating the traffic near Hebbal. We did not take the elevated highway. The bus turned off the highway after Jakkur airstrip, headed straight to the Yelahanka pick-up point - near Shushrutha Hospital. We got off from here by 2236hrs. I dozed off for a while, and woke up just as the bus pulled in to a restaurant for dinner break (2330hrs) - we were at Hotel Swagath Delicacy near Chikkaballapura. 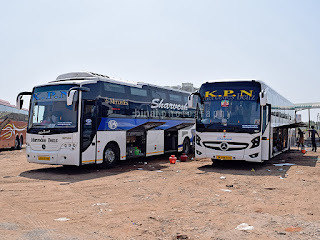 The place was full of KSRTC buses - Sleepers and Volvos! I used the restroom, walked around a bit and stocked some snacks for the next day. We started off at 2348hrs. I had a nice long sleep after that, and woke up only as the lights came on followed by the conductor calling out for passengers alighting at Mantralaya (0439hrs). I was sure we were quite early. 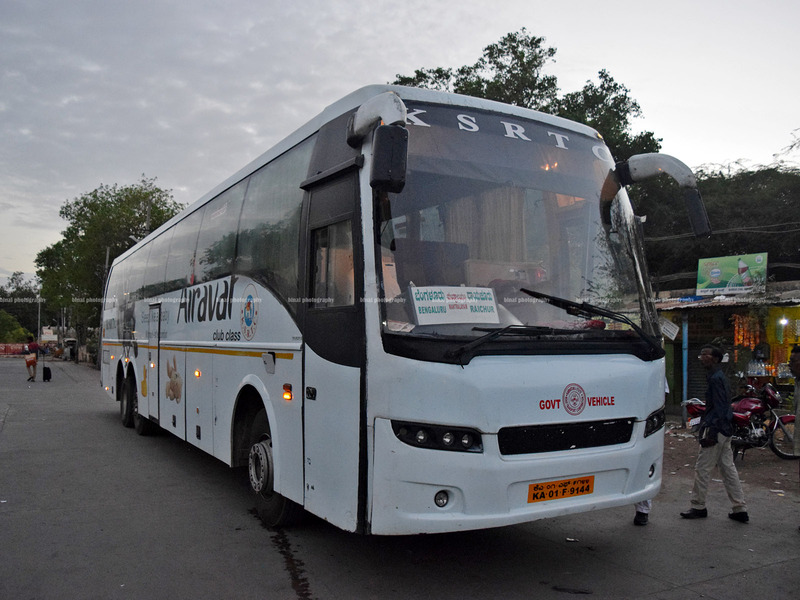 I slept for a while more, and got up seeing the bus stopped somewhere - we were near Raichur Railway station. We slowly crawled past Ambedkar circle and turned towards the bus station. We finally enter Raichur bus station at 0541hrs - 26 minutes before time! I was impressed with the driving! 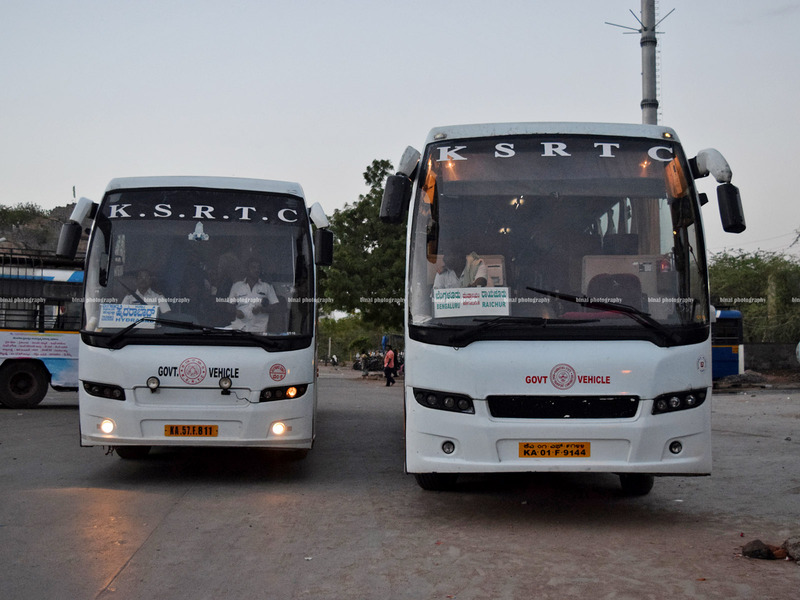 Summary: The bus, KA-01-F-9144, homed at Bengaluru-4 depot had clocked about 11.32 Lakh kilometres. The maintenance was above average - the ride was good, but the rear suspension seemed to require maintenance. It rattled through the night. The driving style was great - he did lug in the beginning, but picked pace later. We left 11 minutes late, but arrived at the destination a while 26 minutes before time. This allowed me to stretch a bit and catch up with some sleep as well. Overall, excellent crew and great service! Will I take this service again? There aren't many options! Will surely repeat!